Sometimes when we are renting, it is really easy to just sort of make-do and not really create a "home". Not at all what Emily @ Gold & Stripes did. 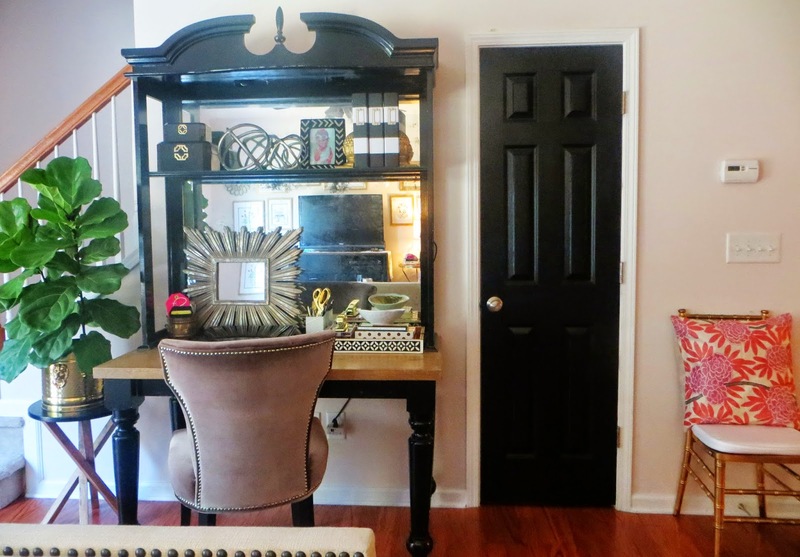 She has turned her rental into a showplace that definitley highlights her style and her many talents. You are in for such a treat, I think she is fabulous and love, love, love her home and her style. Hi, everyone! I'm Emily from Gold & Stripes. 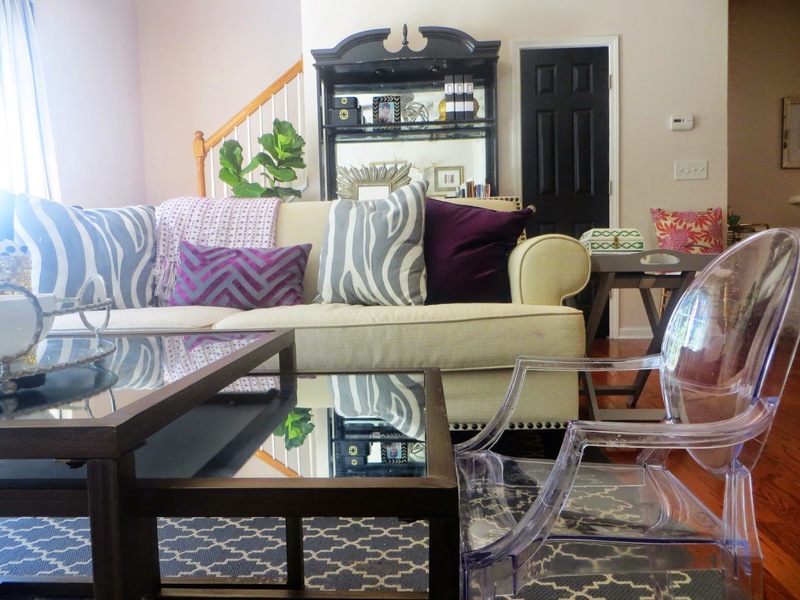 I love to blog about my home, DIY projects, and shiny things. I am so delighted to be here today sharing my favorite room in my house. I love reading Marty's blog and was thrilled when she asked me to guest post for a day. My method for pulling it all together is less of a "method" and more of a "buy what you love and throw it all together" I'm all about searching for things that truly reflect my style and can stand the test of time in my home. Buying trendy accessories and small items is great and I do it frequently. But when it comes to large items, I really try to stick to that method. I do have a couple rules for every space I decorate. I like to keep the walls neutral colors which has worked out since we're not really able to paint them at the moment. I also try to keep my large furniture purchases neutral colors and I allow the accessories and fabrics to do the talking. I have been crushing hard on purple hues this year and I've always got to have a little bit of pink :) The great thing about this room, is that if I grow tired of the color scheme, it's a matter of changing out some art and pillows. 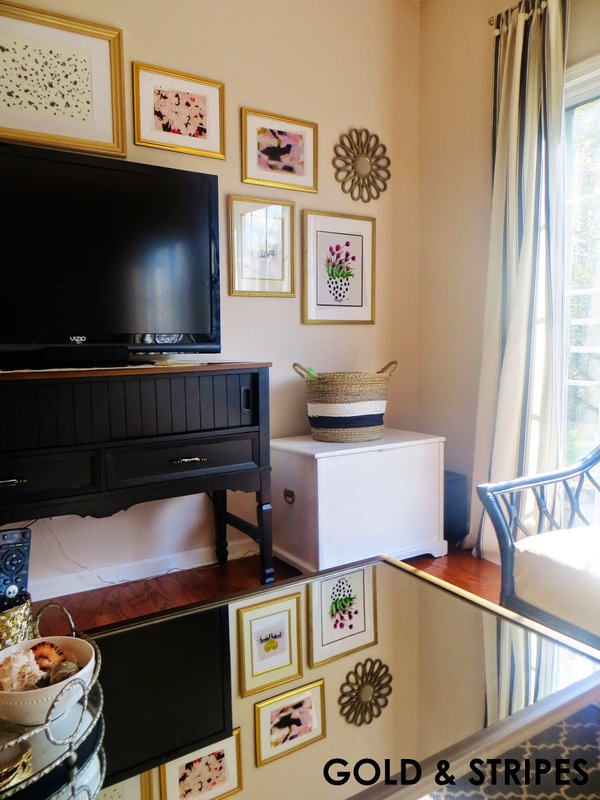 The gold framed gallery wall was a project I just finished recently. 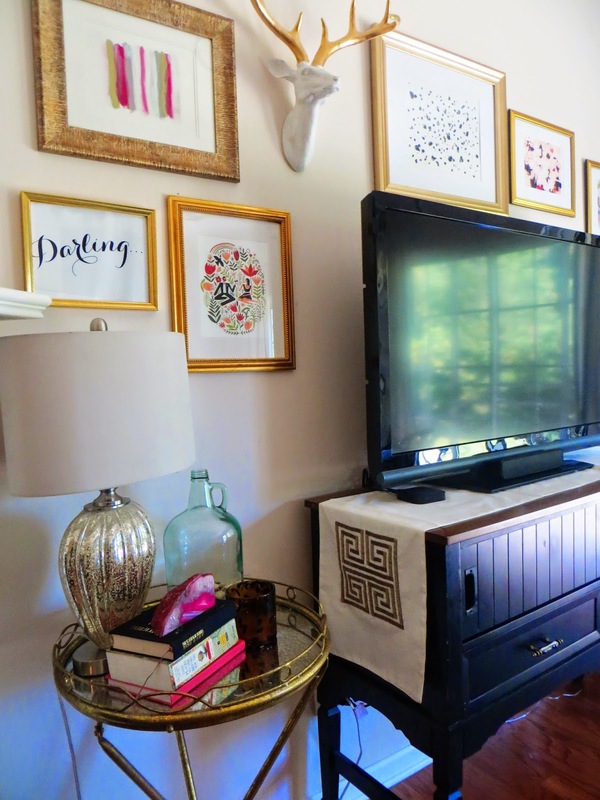 Decorating around a large television on a big blank wall is tricky, but incorporating a gallery wall helped to take the focus away from the less aesthetically pleasing things (aka giant TV) ! 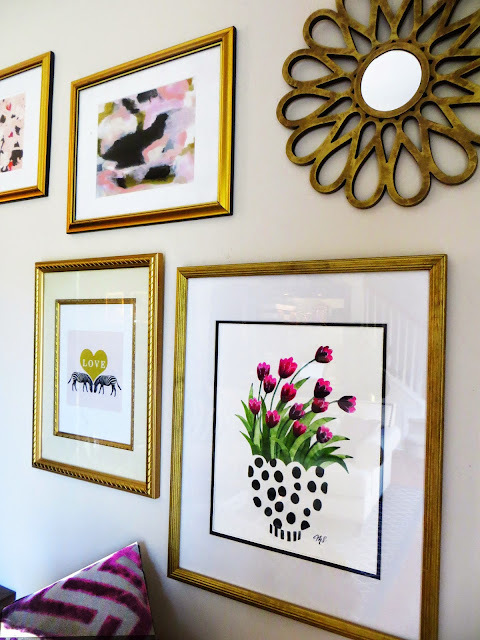 I wanted the gallery wall to reflect my personality - eclectic and colorful. But I also wanted a cohesive look so I scoured thrift stores for gold frames. I want my home to feel cozy and "lived in" and I try to reflect that through thoughtful accessories. My daughter collects seashells every time we go to the beach so we keep a bowl of all her shells on our coffee table and we use candle holders to store our remotes and playing cards. I also keep a glass jug of all our wine corks. It's taking surprisingly long to fill this baby up, but don't let that fool you. We love our wine! I love color and bold patterns! And I'm a huge fan of bringing in texture through indoor plants, warm metallics, and textiles. Was I right? This place is gorgeous and she just seems to do it all so effortlessly. You know how much I love to accessorize and she has mastered this art. There is tons of inspiration everywhere you look. Now if you don't follow her already, by all means, run on over and click that button. You don't want to miss a single post. Thanks so much Emily, I have loved being able to feature you this week. You put things together good. Your home is gorgeous!!! 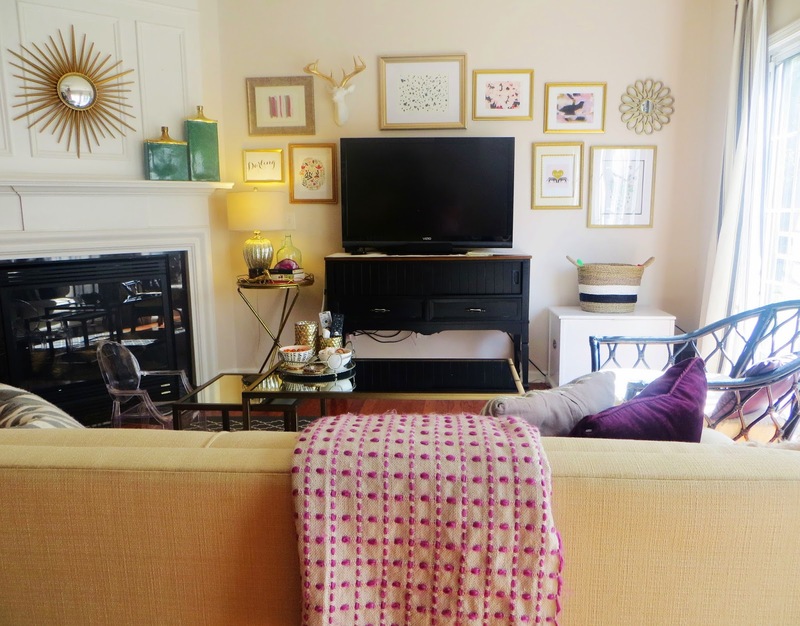 I love the TV stand and adore the tulip painting. I'm not brave when it comes to mixing patterns but love how it looks. Beautiful job with this room. I love the idea of using candle holders for the remotes! Hmmm, it doesn't take us any time at all to fill up our cork jar. Hmmm. I love the gold accents it looks very fresh and clean. A nice way to update without a major makeover! Great post! What a beautiful space Emily created!! Such a beautiful home! 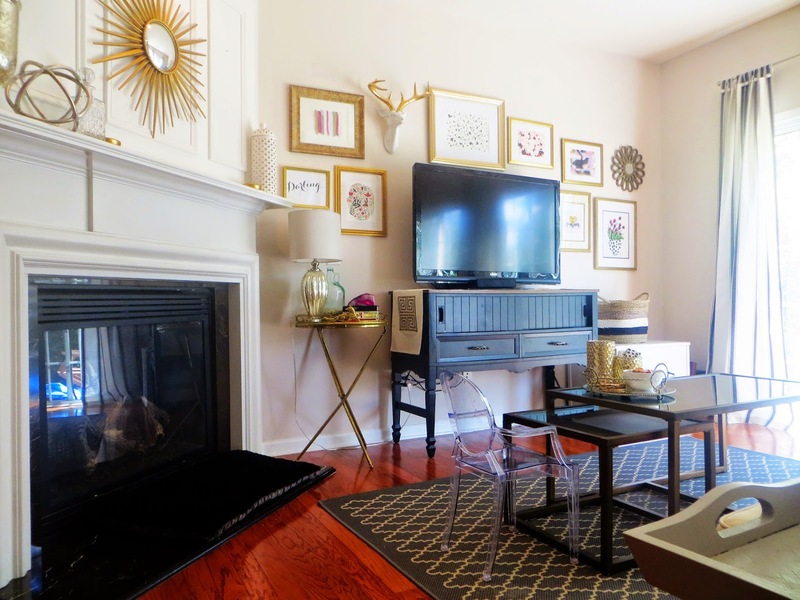 Emily did a fantastic job with turning her rental house into a home. Great tips Marty! I really love your living room and the gold accents. They are very nice in your home. she did a wonderful job turning the rental house into a such a warm and cozy home. thanks for sharing Marty! What a beautiful home. Love the gold decor elements. Thank you for sharing, now her newest follower!